Do any states have laws that protect student expression rights? The answer is yes – there are a handful of states with laws regarding different forms of student expression rights. As you know, the First Amendment to the U.S. Constitution grants you freedom of speech and assembly. States can also provide protection for its citizens by passing their own laws or regulations. Below are some of the states with student free expression laws, their statute numbers so you can look them up at the library or online, and the year each law was passed. creates a substantial disruption of the orderly operation of the school. The Colorado Student Free Expression Law specifies that “Expression which is false as to any person who is not a public person” is not protected. It also defines the duties of student editors and the school’s publications advisor. The Iowa Student Free Expression Law specifies that official school publications means material produced by students in the journalism, newspaper, yearbook, or writing classes and distributed to the student body free or for a fee. 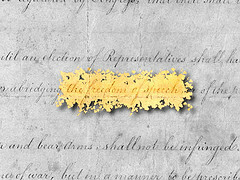 The Massachusetts Student Free Expression Law states that freedom of expression shall include without limitation the rights and responsibilities of students to express their views through speech and symbols, to publish and disseminate their views, and to assemble peaceably on school property for the purpose of expressing their opinions. Oregon – (2007) – the Oregon Student Free Expression Law can be found at Section 336.477 (2007). In 2012, a bill was introduced in the Vermont legislature regarding student free expression. Connecticut, Kentucky and Washington were considering similar legislation. You can find the pending bills on the web site of each state legislature. Thank you very much for the citation, Rob. We added it to this post. Can a teacher make a student turn his/her braclet inside out? Depending on your Code of Conduct and the rules spelled out in the Sudent Handbook, yes they have the authority to ask you to turn your T-shirt or bracelet inside out. If the message is offensive and causes a disruption at school, the administration can take action. Read this story about the “I (heart) boobies” bracelet at one school.